Tip #1~ Check with your city/town about any RULES/LAWS as to where signs can be posted. Tip #2~ List an ADDRESS on the sign so people can find you. 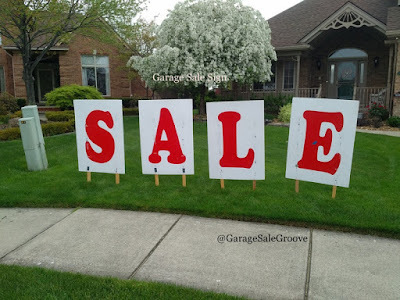 Tip #3~ Put DATES and TIMES of the sale on your sign. Tip #4~ Make the INFORMATION readable! USE LARGE PRINT in DARK marker. Tip #5~ If posting on private property...ASK the owner of the property for permission to put up your sign. Tip #7~Add BALLOONS to sign to be easily seen. 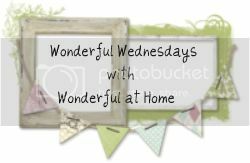 Tip #8~ Put clear plastic wrap over sign if there is a threat of bad weather. 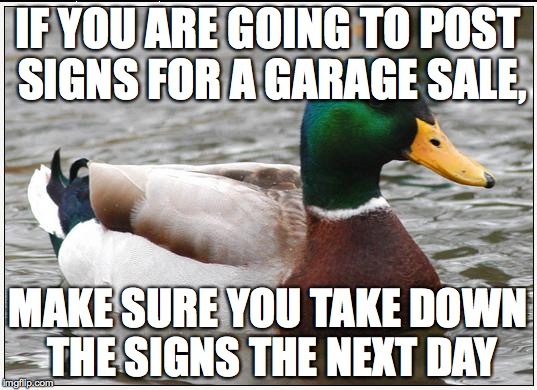 Make sure you can still read your sign clearly! Tip #9~ If people must travel a distance to get to you from your sign, use more signs along the route to guide them to you. You can just put arrows on these signs to show the directions to go. OR BETTER YET THE SAME DAY!! !